Tri Heart Plus is a once-a-month preventative medication that protects your dog from parasitic worms, like hookworm, roundworm, and heartworm. Safe for dogs six weeks and older, Tri Heart Plus is a flavored, chewable tablet, so your dog will be getting all their medicine while thinking they are just getting a treat! 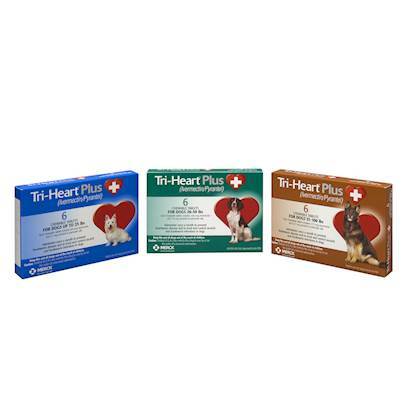 Available in 6 or 12 month doses, Tri-Heart Plus has the same active ingredients (ivermectin/pyrantel) as Heartgard Plus, so you know it works, and it's at a lower price. Tri Heart Plus is intended to prevent heartworm, hookworm and roundworm. Already infected dogs need to be de-wormed prior to administering Tri heart Plus. Additional side effects include anorexia, ataxia, convulsions, depression, diarrhea, hypersalivation mydriasis, staggering, and vomiting. Dogs must be tested for heartworm infection before starting a preventive program like Tri-Heart Plus. Tri Heart Plus may be administered orally once a month, at the veterinarian prescribed dose. Most dogs will readily chew the medication, but if your dog is used to swallowing pills, break it up into smaller pieces. Make sure the dog consumes the entire dose.